You know your character has made an impact when you start seeing your face on T-shirts. According to Coyle an entire Free Bates campaign is being waged round the world, after the stoic valet was sentenced to life imprisonment for the murder of his wife. Despite the public clamour (and the T-shirts) series three begins with Bates no closer to freedom than when we left him. There is always a sense with Bates that beneath a calm veneer there is anger just waiting to be vented. How far can a man be taunted before he snaps? While Anna tries to find proof of Bates’ innocence, the valet himself has to contemplate a life behind bars. Coyle knows of what he speaks – some of Bates’ prison scenes were filmed at Lincoln Castle, in a three-tiered preserved Victorian prison set within the castle walls. These, then are not happy times for Bates. His legions of fans will be asking if he will ever find contentment. Brendan Coyle says he asked himself the same question, while stuck out filming away from the rest of the cast. “I can’t possibly tell you if domestic bliss will ever come. What I do know is that the house and Anna never lose faith. My own guess? Who knows – I like to play with options. 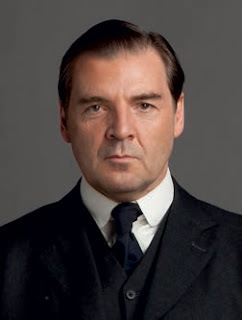 If the so-called ‘Cult of Bates’ has done little to help the valet himself, the popularity of the character has had some happier outcomes for Brendan Coyle. The comedy, in which Coyle stars as a down to earth electrician, has been picked up for a second series already. He says doing comedy as a counterpoint to filming Downton Abbey gives him an opportunity to flex a different muscle. He cites the attention to detail he’s seen in the gaol sets and some of the city scenes. One notable omission at the beginning of this series however, will be Mr Bates’ trusty stick.